ALEC has recently an annual budget of approximately $7 million and claims that hundreds of its model bills become law each year. It hides its inner workings, including the fact that its model bills often are drafted and always are pre-approved by corporations and lobbyists. ALEC calls itself the nation’s largest group of state legislators, but 98% of its funding comes from corporations and sources other than dues from elected officials, as the Center for Media and Democracy has determined as part of its ALECexposed.org project. 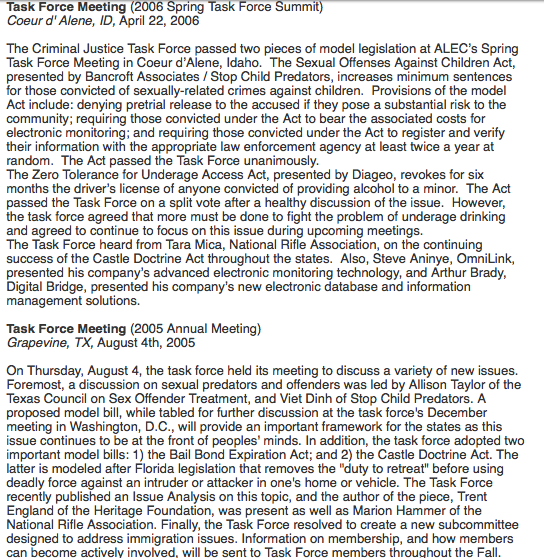 In August 2005, in Grapevine, Tex., NRA lobbyist Marion Hammer asked legislators and lobbyists at a closed-door meeting of ALEC’s "Criminal Justice Task Force" to adopt the Florida "Castle Doctrine" bill as an ALEC model bill. The NRA said her pitch "was well received," and the bill was approved "unanimously." 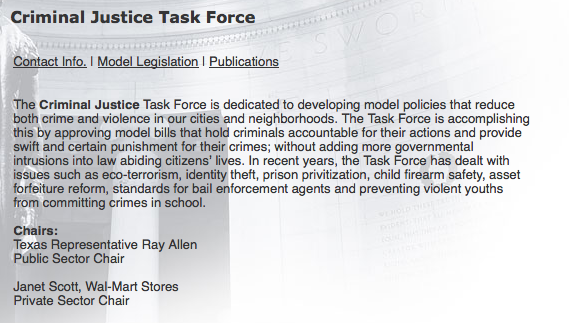 At that time, ALEC’s public-private Criminal Justice Task Force was co-chaired by Wal-Mart -- the nation’s largest seller of guns and ammunition. ALEC’s staffer for the task force was Chris Oswald a former “State Liaison” for the NRA. Corporate representatives and state legislators on ALEC Task Forces have equal votes on proposed model legislation, so the Florida law was ratified by Wal-Mart and its 2005 public sector co-chair, Texas Rep. Ray Allen, along with other state legislators and corporate lobbyists. It was endorsed by a representative of the Koch-funded Heritage Foundation, according to minutes of the meeting prepared by ALEC. 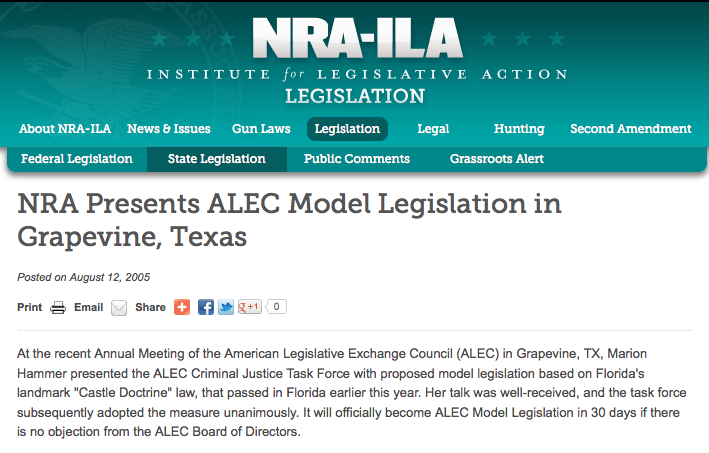 At the next ALEC Criminal Justice Task Force meeting, in Coeur D’Alene, Idaho, in 2006, the NRA’s representative to ALEC, Tara Mica, reported on the “continued success” in securing passage of ALEC’s “Castle Doctrine” bill in other states. In 2007, an ALEC "Legislative Report Card" boasted that the ALEC/NRA Castle Doctrine bill had been introduced or passed in numerous states. ALEC also highlighted ALEC legislators who had introduced versions of the model bill, including Texas state Sen. Jeff Wentworth and Rep. Joe Driver. To date, more than two dozen states have adopted Castle Doctrine bills with ALEC/NRA DNA. Wisconsin Gov. Scott Walker, an ALEC alum, signed into law an NRA-backed bill with some provisions similar to the ALEC bill in 2011. Similar bills are pending in other states. NRA President Wayne LaPierre said NRA lobbyist and former president Hammer "conceived" of the Florida bill and lobbied it into law. She ridiculed opponents of the bill, calling them hysterical, and helped the bill’s co-sponsors, Florida state Sen. Durell Peaden (R-Crestview) and Rep. Dennis Baxley (R-Ocala), get it passed. In 2005, Peaden was an ALEC leader, serving on the Executive Committee of the "Health and Human Services Task Force." The NRA has pushed several other ALEC "model" bills to change state laws on firearms. CMD has documented ALEC's legacy of pushing extreme gun legislation, while the organization's corporate board has included Koch Industries. ALEC has said that the Stand Your Ground legislation is no longer one of its model bills but it has done nothing to get the Florida law it previously endorse and pushed for years repealed. Brendan Fischer, ALEC Ratified the NRA-Conceived Law That May Protect Trayvon Martin's Killer, March 21, 2012. Brendan Ficher, Machine Guns on the Vegas Strip? In Nevada, ALEC/NRA Bill Introduced to Stop Cities from Banning Machine Guns, March 22, 2013. Lisa Graves, Resources for Investigating ALEC/NRA Gun Bills , March 30, 2012. CMD's research helped break the story of ALEC's role in pushing the Florida Stand Your Ground law as a national model.